A Peaceful Pele, in legend Pele, the Hawaiian Volcano Goddess appears as an old hag or young maiden. Often her wrathful and destructive side or portrayed in art. 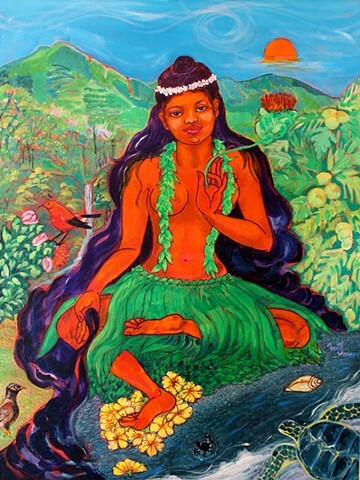 I chose to show her as a Hawaiian Mother Earth, creating new land with her lava, surrounded by her Island abundance of breadfruit trees, lehua flowers, a honu (sea turtle) and a'ama (crab) as well as a mynah bird and apapane bird perched on lehua blossom.